Vedanta, the ultimate knowledge of life brought to light by the great Veda Vyasa, illuminates the highest value of philosophy as a living reality. Great sages of India, such as Adi Shankara, Ramkrishna Paramhansa, Raman Maharishi, and in our time Maharishi Mahesh Yogi and his master Swami Brahmanand Saraswati, lived their lives in Unity Consciousness, the state of complete freedom described as Advaita (non-duality) and Moksha (liberation), and guided humanity on the path to enlightenment. Once a year an international Vedanta Congress takes place in alternating locations in the world. It draws leading authorities from India and the entire world for an exchange about the Vedanta philosophy and way of living. The Jawaharlal-Nehru-University in New Delhi, India hosted the congress “Modern Perspectives on Vedanta” in December 2011. Lothar Pirc, one of the keynote speakers, gave a widely acclaimed presentation on the topic: Maharishi Mahesh Yogi’s Insight into Vedanta, the Ultimate Knowledge of Life, and Its Application to Bring World Peace – from Philosophy to Science. This presentation was based on an article that he wrote together with Br. Girish Momaya and Susan Brown. The Jawaharlal-Nehru-University published the proceedings of this Congress in a comprehensive compendium in which this 28-page article is presented in a prominent location. 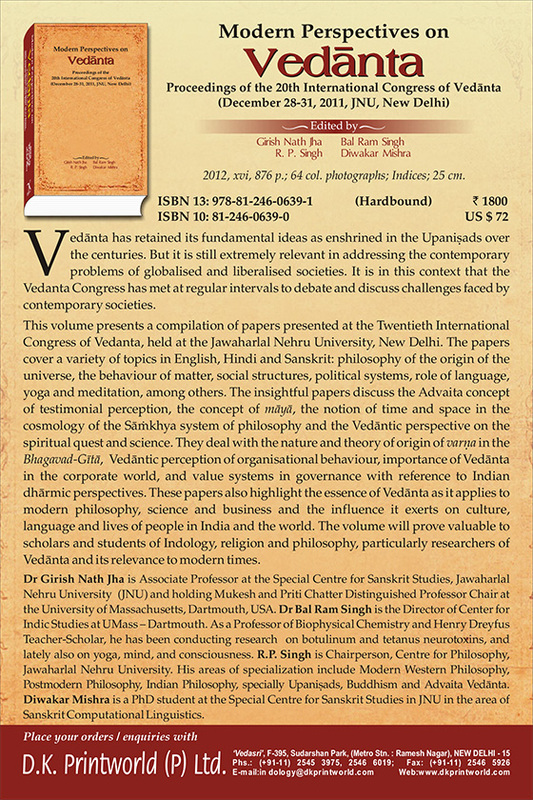 Today, this handbook serves as an official reference guide on Vedanta in Indian universities.